Recently I’ve been trying out a diff erent coffee blend – and some different chocolate. 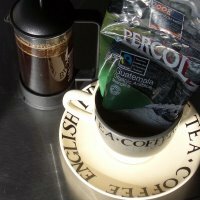 My current coffee selection is Percol Guatemala (fairtrade and organic). Its very different from the Union Hand-Roasted I was drinking (see my earlier post) and at first I wasn’t so keen. It seems to be a weaker brew even though they are both graded as 3 so I’ve been having to use a bit more of the grounds in each pot. Its quite smokey in flavour and when I paired it with Green & Blacks Cherry chocolate it just didn’t quite work. Now I’ve switched chocolate (well actually I’ve eaten all the Cherry bar) to Green & Blacks Dark 85%. This chocolate is smooth and intense and balances the smokiness of the coffee well. It’s a really nice chocolate bar at a not too mad price for this level of flavour. Coffee wise, for my money the Union Hand-Roasted has the edge in the taste stakes, its just that bit more interesting.